Upgraded with Thunderbolt 3, an Intel 7th-Gen Kaby Lake processor, and a Thunderbolt-to-Ethernet (T2E) 10GbE converter, the TVS-882BRT3 8-Bay NAS Enclosure from QNAP is designed for online video editing and high-speed file sharing. It includes a pre-installed Blu-ray drive, allowing users to immediately experience extensive disc applications, including backing up disc-based content to your NAS for long-term storage and easier sharing, or the writing of NAS-based files to optical media for an extra layer of data protection. There are also three PCIe Gen 3.0 slots, two of which are occupied with a dual-port Thunderbolt 3 expansion card, while the third slot is empty and ready for peripherals such as a 10GbE/40GbE NIC, SAS storage expansion card, or a USB 3.1 10GbE adapter, making the TVS-882BRT3 well-suited for diverse storage applications. The TVS-882BRT3 is powered by a 3.6 GHz Intel Core i7-7700 Quad-Core processor and 32GB of 2133 MHz DDR4 RAM in a 4 x 8GB configuration, which can be upgraded to 64GB. Network connectivity is achieved using the four Gigabit Ethernet ports which help with service binding, port trunking, and MPIO configurations, or access 10GbE networks using the Thunderbolt-to-Ethernet 10GbE converter via Thunderbolt 3. This NAS also supports JBOD and a variety of RAID modes, including RAID 0, 1, 5, 6, 10, and hot spare, each of which offer data redundancy, speed, or a combination of both. This 8-bay enclosure has the ability to natively house both 3.5" and 2.5" SATA III and SATA II hard drives or SSD drives. When using all four Gigabit Ethernet ports, the TVS-882BRT3 can reach download speeds of up to 447 MB/s and upload speeds of 451 MB/s. Once volume encryption is turned on, transfer speeds are still very high, with download speeds of up to 443 MB/s and upload speeds of up to 450 MB/s. Using the external four 40 Gb/s Thunderbolt 3 ports, five 5 Gb/s USB 3.0 Type-A ports, and three HDMI 1.4b ports, this QNAP NAS can be connected to other QNAP devices, as well as other external drives and displays. Internally, there are two M.2 slots for tiered storage and cache acceleration using separately sold M.2 2242, 2260, 2280, and 22110 flash modules. Additionally, the TVS-882BRT3 is validated with FIPS 140-2 AES 256-bit encryption, helping to prevent sensitive business data from unauthorized access and breaches. Using QNAP's tiered storage functionality, storage efficiency is optimized across M.2 SSDs, SATA SSDs, and SATA HDDs. Frequently used "hot" data is stored on high-performance SSD tiers, while less-accessed "cold" data is kept on higher-capacity hard drives. Using Application-based Partitioning, the M.2 and SATA storage devices can be configured as independent partitions for different applications, helping to ensure a sufficient throughput level for all applications. The TVS-882BRT3 8-Bay NAS Enclosure operates on 100-240 VAC, 1.5-3A, at 250W. It includes four Ethernet cables, a power cord, two screws and two bolts for M.2 installation, twenty-four flat head screws for 2.5" drives, two M.2 SSD heatsinks, and an IR remote control. Protection is provided by a limited 2-year warranty. Browse files directly through File Station and share instantly with a share link. Qfiling enables automatic file organization, while Qsirch allows for quick full-text searches. Write important data to discs using a virtual machine or Linux Station for prolonged preservation. Low-cost discs are also suited for one-time file sharing. Enable high-speed collaboration via high-bandwidth Thunderbolt 3 ports or install a QNAP PCIe 10GbE/40GbE NIC and use with a 10GbE switch. The TVS-882BRT3 comes with a preloaded Blu-ray ODD for you to enjoy disc-related applications instantly. You can browse disc files directly through File Station and quickly backup the files to NAS, saving you time and trouble from transferring files to computer first then to the NAS. Multiple sharing modes (email, social network, sharing link, share to other NAS users) allow you to easily share information to others, solving the inconvenience of sharing disc files before. The TVS-882BRT3 also supports USB disc drives. DVDFab is third-party software that requires the purchase of a license (sold separately). It is not a QTS app and must be run in a virtual machine such as Linux Station. DVDFab allows users to author image and video files to DVD and Blu-ray discs. To write other types of files, another optical disc authoring software may be used. Powered by high-performance 7th Generation 3.6 GHz Intel Core i7-7700 Quad-Core with 32GB of DDR4 2133 MHz RAM (upgradable up to 64GB), four Gigabit Ethernet ports, and a SATA III 6 Gb/s interface, the TVS-882BRT3 provides up to 447 MB/s read/write speeds. The TVS-882BRT3 features Intel AES-NI-accelerated encryption for both full NAS volumes and shared folders to drive transfer speeds of up to 443 MB/s, boosting system performance and security while ensuring the safety of sensitive data stored in the TVS-882BRT3. The Thunderbolt 3 ports provide up to 40 Gb/s of bandwidth for high-speed data transfers. Users can also utilize its Thunderbolt 3 ports to have 10 Gb/s USB 3.1 Type-C 3.1 (USB 3.1 Gen 2) connectivity for quickly transferring and backing up large-sized media files from USB Type-C devices. The TVS-882BRT3 is a good match for Thunderbolt 3-capable MacBook Pro systems and is backward-compatible with Mac Pro and iMac systems that feature Thunderbolt 2 via a Thunderbolt 3 (USB Type-C) to Thunderbolt 2 converter. The higher bandwidth is especially suited for creative professionals and enthusiasts from photographers and filmmakers to graphic designers who focus more on 4K or 3D workflows. Final Cut Pro X 10.3 adds support for the SMB protocol, allowing you to easily store files in the TVS-882BRT3 and share files with Windows, and other devices using a Thunderbolt, 10GbE, or 1GbE connection. Up to 4 Thunderbolt devices can connect to the TVS-882BRT3 to process real-time video editing simultaneously without impacting NAS performance, while 4K videos can be directly displayed using the TVS-882BRT3's HDMI output. Coupled with its large capacity potential, the TVS-882BRT3 provides a strong storage solution with high performance for high-resolution file storage and I/O-intensive tasks to increase productivity in multi-workstation environments. The TVS-882BRT3's disc-writing functionality also allows you to directly copy your creative work to disc for offline sharing. As Apple computers do not natively support 10 Gigabit Ethernet, Mac users previously needed to purchase a Thunderbolt-to-Ethernet adapter to connect to high-speed Ethernet networks. The Thunderbolt-to-Ethernet (T2E) allows computers without Ethernet ports (such as the MacBook Pro) to access 10GbE network resources over a Thunderbolt connection to the TVS-882BRT3. This saves users from having to buy adapters or converters and streamlines the connectivity process. With four Thunderbolt 3 ports on the TVS-882BRT3, you can flexibly arrange the connection of your computer workstations with the TVS-882BRT3 and its storage expansion enclosures based on your needs. Attach three Mac workstations to the TVS-882BRT3 via Thunderbolt 3 ports for online video editing, while the remaining Thunderbolt 3 port is used for storage expansion by connecting up to six NAS expansion enclosures (TX-500P / TX-800P). When using multiple workstations to work together to speed up a project, you can connect each workstation separately to the Thunderbolt 3 ports on the TVS-882BRT3 to enjoy simultaneous, speedy video editing. Large-sized video production studios often require multiple servers to increase productivity with different workflow stages, such as capturing, editing, production, post-production, and dubbing. In this situation, it can be helpful to daisy chain an additional six TVS-882BRT3 units to the original TVS-882BRT3 and arrange each NAS for dedicated workflow stages, while the other Thunderbolt 3 ports are connected to the workstations for smoothly accessing large-sized video files. Rest assured your massive files are safely stored in the TVS-882BRT3 which supports seamless capacity expansion to offer you abundant storage. You can connect up to six NAS expansion enclosures (TX-500P / TX-800P) to the TVS-882BRT3 through Thunderbolt 3 ports to enjoy high storage capacity. The TVS-882BRT3 provides two M.2 SSD slots dedicated to caching for increasing IOPS performance. Using an SSD cache boosts overall system performance, and is well-suited for improving the overall workflow of random IOPS-demanding applications such as virtualization. Qtier auto-tiering technology automatically moves frequently-used files to SSDs and infrequently-used files to HDDs for optimal storage performance. The TVS-882BRT3 provides three PCIe Gen 3.0 slots. Two slots are pre-installed with dual-port Thunderbolt 3 cards, while another slot allows for a wide range of storage scenarios. You can install a 10GbE/40GbE NIC for network expansion, a 10 Gb/s USB 3.1 adapter, or a compatible Wi-Fi adapter to use the TVS-882BRT3 as a wireless access point. The TVS-882BRT3 comes with three HDMI ports for using three monitors in either "duplicated" or "extended" desktop configurations. QNAP Linux Station is integrated with Ubuntu OS, allowing users to download and install versatile multimedia apps from Ubuntu Software Center, such as Plex Media Server, KMPlayer, LibreOffice, and VLC to play videos on NAS or Blu-ray discs. QNAP's HD Station also allows users to directly enjoy multimedia using HD Player or third-party players such as Plex Home Theater. By connecting the TVS-882BRT3 to a HDTV or A/V receiver with HDMI output, you can enjoy watching videos with up to 4K resolution. The bundled QNAP remote control allows you to control the TVS-882BRT3 and enjoy an immersive audiovisual experience. You can customize the actions of individual buttons of your QNAP remote control using QButton. From playing music, to viewing surveillance feeds in Surveillance Station, to shutting down or restarting the NAS, everyday and common tasks can be just a button press away with QButton. Virtualization Station allows you to host virtual machines (VM) on the TVS-882BRT3 and access them via a web browser or VNC. Virtualization Station supports multiple operating systems, fast VM creation, VM backup & restoration, VM import/export, snapshot, and Device Management for centrally managing VMs. Virtualization Station allows the TVS-882BRT3, VMs and containers to share the same LAN port. No longer constrained by physical network performance, high-speed virtual switches increase data transfers between VMs, containers, and NAS through the internal interface. The TVS-882BRT3 also features Container Station, which integrates LXC and Docker lightweight virtualization technologies. You can operate multiple isolated Linux systems on the TVS-882BRT3, as well as download apps from the built-in Docker Hub Registry. Container Station also supports the QIoT Containers platform that helps quickly structure your IoT environment and deployment on your private IoT cloud. The TVS-882BRT3 is an iSCSI/IP-SAN storage that supports VMware and Citrix, and is compatible with Microsoft Hyper-V and Windows Server 2012 R2, fulfilling the need for flexible deployment and management in virtualization environments. The TVS-882BRT3 supports VMware VAAI and Microsoft ODX to increase performance by offloading server loading for ESXi server and Hyper-V respectively, and supports QNAP vSphere Client plug-in and QNAP SMI-S provider with enhanced operational efficiency and management in virtualization applications. With modularized multiple applications and functions, QTS enhances management efficiency, personal productivity, multimedia, and much more. Intelligent agent services have also been added to simplify system operations and management. The user-friendly QTS features an intelligent desktop that allows you to find desired functions quickly, monitor important system information on a real-time basis, open multiple application windows to run multiple tasks concurrently with greater working efficiency, and provides a built-in App Center with install-on-demand apps to extend NAS functionality. Qfiling helps automate file organization for sorting files spread through multiple folders, helping to reduce the time needed for finding important files. Users can categorize files, determine filing conditions, and schedule filing tasks to be carried out periodically. The "Recipe" feature allows users to save frequently-used filing conditions as an "exclusive recipe," then the next Qfiling task can be run with just one click using the recipe. IFTTT (If This Then That) is a web automation services and with QNAP IFTTT Agent, you can create a near-unlimited number of NAS-related applets on the IFTTT website for greater automation and to boost your productivity. For example, if you set a trigger as "Any new photo (using Android Photos service)" and the action as "Download the URL to QNAP NAS (using QNAP service)," then all the photos taken using your Android device will be automatically downloaded to TVS-882BRT3. 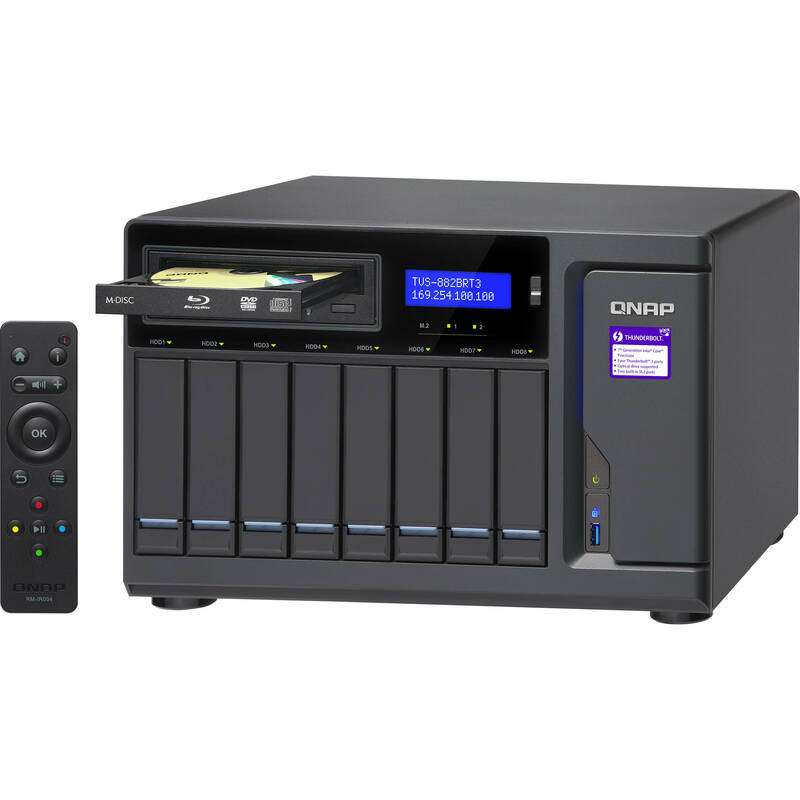 QNAP Hybrid Backup Sync provides a well-rounded solution for data backup, file synchronization, and disaster recovery. With Hybrid Backup Sync, you can easily and securely backup data from your NAS to several local, remote, and cloud storage spaces. In the event of system crashes or critical hardware failure, you can quickly restore data from these storage spaces, minimizing downtime and reducing overall loss. Hybrid Backup Sync also takes advantage of cloud storage for one-way sync of your data to cloud storage through RTRR, Rsync, FTP, and SMB protocols, or two-way sync your NAS with remote NAS/cloud services. The TVS-882BRT3 supports SMB, NFS, and AFP, allowing you to quickly share files to Windows, Mac, and Linux/UNIX devices. With QNAP's Qsync utility, the TVS-882BRT3 becomes a safe data center for file synchronization with huge storage potential. Files uploaded to TVS-882BRT3 can be synchronized to the linked devices such as computers, laptops, and mobile devices. You can also sync shared folders to increase the flexibility of collaboration and file sharing. QRM+ is QNAP's Centralized Management Solution, designed for IT teams, for networked computing devices. It provides a single-point solution to discover, map, monitor, and manage the critical computing devices (including servers, PCs, and thin clients) in your network, and facilitates device discovery with the graphical topology diagram. QRM+ supports IPMI 2.0, provides remote KVM (Keyboard, Video, Mouse) for certain IPMI devices, and supports tracking every action using KVM recording and playback. Simply install QRMAgent on your Windows and Linux devices and you will see their system status on the QRM+ management interface. With centralized management using QRM+ on the TVS-882BRT3, IT infrastructure and device security is enhanced while troubleshooting and network resource performance analysis is simplified. The TVS-882BRT3 supports capacity expansion by connecting up to six Thunderbolt storage expansion enclosures. You can gradually expand the TVS-882BRT3's storage on-demand, and use the QTS Storage Manager to handle the NAS capacity expansion and storage expansion enclosure management. Up to six TX-500P expansion enclosures are supported, for a total of 38 hard drives (NAS + enclosure), and up to six TX-800P expansion enclosures support up to 56 hard drives (NAS + enclosure). Surveillance Station is a professional network surveillance Video Management System (VMS) that offers a user-friendly management interface, over 3000 compatible IP camera models, and expandable IP camera channel licenses. It supports real-time monitoring, video & audio recording, and playback with a wide range of customizable settings. You can also install the Vmobile app on your iOS or Android devices to manage the monitored channels anytime and anywhere, or install the Vcam mobile app to turn your device into a network camera to instantly record to your TVS-882BRT3. The TVS-882BRT3 offers 8 free IP camera channels and you can expand up to 80 channels by purchasing additional licenses. The TVS-882BRT3 supports QVR Pro that integrates QNAP's professional QVR system into the QTS operating system. You can arrange a dedicated, independent storage space for surveillance data on the NAS and leverage the advantages of scalability and storage manageability from QTS. QVR Pro features a flexible monitoring interface that allows adjusting the proportion and monitor view of IP cameras, supports an upgraded timeline feature that provides instant video search and quick view identification in live monitoring mode, and allows for monitoring views and playing back images without switching between windows. Additional functions like batch adding and editing cameras and searching for cameras across different LANs further save the cost and time in deploying and maintaining a complete surveillance system. With the QUSBCam2 App, USB cameras can be used as ONVIF network cameras. Simply connect it to your TVS-882BRT3, and you can view real-time footage without installing any software. Through QVR Pro, you can even store recordings for playback, allowing you to build a surveillance system with a minimal budget. It can be hard to manage emails and contact information that are scattered across multiple computers, devices, and accounts - not to mention if important emails or contact information are lost or become inaccessible due to account closure or device malfunction/loss. QNAP QmailAgent and Qcontactz helps you centrally store and manage emails and contact information, making them accessible to your devices at virtually any time. And with the Qsirch search engine, you can easily find specific contacts and emails. Number of Bays 1 x 5.25"
Box Dimensions (LxWxH) 19.4 x 17.6 x 14.9"